L’Aldila/The Beyond(1981) is the film that brought interest in the cinema of Lucio Fulci. I became a big fan of his work after watching this movie. Have seen a good portion of his films since. The opening prologue is shot in a gorgeous sepia color. The murder/torture of Schweick represents the censorship and repression of the artist. Anchor Bay did a excellent job in the restoration of the film for DVD. The chain whipping scene in it is a repeat of the one in Don’t Torture a Duckling(1972). The chain whipping in The Beyond is much more gory. There are a couple of reasons why the chain whipping scene in Don’t Torture a Duckling is more powerful and potent then in The Beyond. The scenes take place in natural settings. Goes for violent realism. The death of Maciara is depressing to watch. 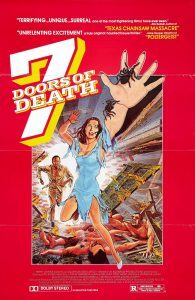 L’Aldila(1981) was part of a trilogy called the 7 gates trilogy. This started with The Gates of Hell(1980), continued with this film, and was to end with The Beyond 2. Unfortunately, this trilogy would never be completed. This is a shame because I would have loved to see that film to know if it was good as the first two movies of the trilogy. The original intentions of The Beyond are different from the final results. This was because of budget and time restrictions. I wonder how much better the pic might have been with a modest budget and a little more time. The make up effects is one of the film’s best features. Despite the low budget, Giannetto De Rossi’s effects are spectacular. The effects are done with flair and pizazz. Giannetto De Rossi did his best when working with Fulci. The effects for the death of Joe the Plumber are very good. The best effects in the film is the scene involving the young girl near the end. The cinematography is spliced with atmosphere and style. Sergio Salvalti contributes to the film’s gothic flavour. The cinematography contains a dreamish flow that makes the film beautiful. The score is one of my favourites for a horror film. The score fits perfectly with the scenes in the film. As good as anything done for Argento by Goblin. The Beyond(1981) is an ‘Absolute Film’ where image and sound are the most important part of a film. On the making of this, Fulci once said, (“My idea was to make an absolute film, with all the horrors of the world. Its a plotless film, there’s no logic to it, just a succession of images”). This is something that people who hate the film don’t and will never understand. Many people do not like this because of its nonlinear structure. He also said, “In Italy we make films based on pure themes, without a plot and The Beyond like Inferno refuses conventions…people who blame the The Beyond for its lack of story don’t understand that it’s a film of images, which must be received without any reflection”. Receiving a movie like this without any reflection is a hard thing for many film goers to do. The works of Antonin Artoud and H.P Lovecraft play a major influence on The Beyond(1981). Fulci was inspired by this controversial French artist. The ideas of Artoud are present in most of Fulci’s work. Schweick the painter bears a little resemblence to Antonin Artoud. Artoud was the founder of “The Theater of Cruelty” which talked to “Restore to the theater a passionate and convulsive conception of life, and it is in this sense of violent rigor and extreme condensation of scenic elements that the cruelty on which it is based on must be understood”. This idea can be applied to The Cinema and this film. The comment “Violence is Italian Art” by Fulci is relative to the movie and the history of Italian art. Its one of the few films where atmosphere and gore mix well together. Has good moments of spirital horror. The atmosphere is eerie and terrifying. The gory set pieces are satisfying. The surreal atmosphere and bloody imagery is what makes the film a classic. The Beyond would influence many later American and Italian horror flicks. One, The Evil Dead(1983). Two, Hellraiser(1987). Three, Hellbound:Hellraiser 2(1988). Four, The Church(1990). Finally, Dellamorte Dellamore(1996). The Beyond(1981) will never be a mainstream favourite because its not for everyone. The themes are well written by Dardano Sacchetti. Catriona MacColl and David Warbeck are very good in the roles of the heroine and hero. Veronica Lazar from Inferno(1980) is sinister as Martha. The director did a great job with the little resources that he had to work with. The ending will haunt your dreams for days to come.